From Raw Material To Finished Product: An Ancient Craft Revived. 1. Sweet Chestnut or Oak is shaped, using traditional tools to form the four basic components for fencing: posts, rails, pales and lathes. 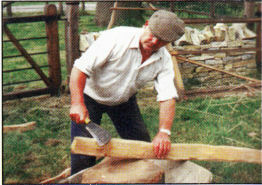 Some tools used are: jig, billhook, axe, saw, sledgehammer, wedges, froe and brake. 2. 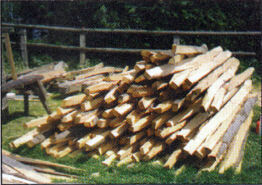 Starting with roughly hewn Oak or Chestnut logs, the raw materials are assembled in lengths prior to siding up or clefting. 3. The posts are squared off and then morticed using o router to form mortices to fit the rails. 4. The beauty of this fencing lies in the irregularity of the prepared posts. 1. 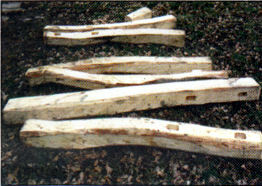 Natural hardwood logs are now worked to make rails. A different technique is used at this point. 2. 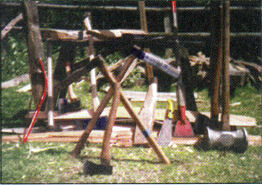 First the log must be split, driving in a metal wedge at a tangent to the grain..
3. 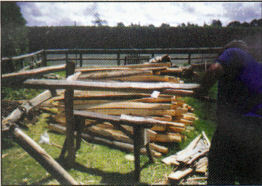 Once the wood has opened up a larger wooden wedge is used to continue the split. Regular checking ensures that the log splits evenly down the centre. 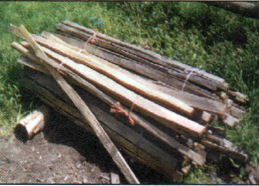 The two halves can be used as posts or split again to make two rails. 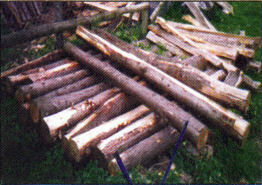 Therefore out of one 8-10" round log two cleft posts or four cleft rails can be produced. 4. Cleft can be cut to any length needed although the standard length is approximately three metres. The rails are now ready to be shaped. 1. 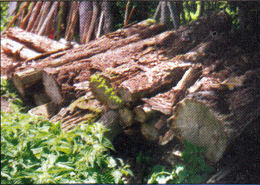 Natural hardwood logs 1. 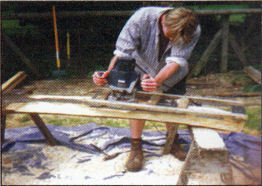 The rail is whittled at both ends to fit the morticed posts using a jig and billhook. 2. Both posts and rails are now ready for construction. 3. Reducing cleft rail for pales or lathes. 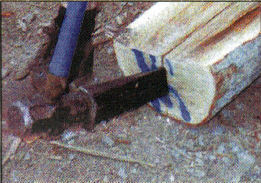 With the use of the froe and brake, the material is reduced to the size required (the straighter the grain and the greener, the easier it is to lathe). 4. Cleft lathes ready for use. 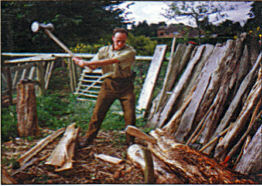 Cleaving (the act of splitting wood) is an ancient practice dating back to the Anglo Saxon and beyond, when it was discovered that a standing tree was more useful felled and the shoots from the stump Allowed to grow to a useful size (up to 20 years depending on use required) then coppiced and cleaved. Each would then regenerate sometimes 4 fold thus rendering the original stump immortal. 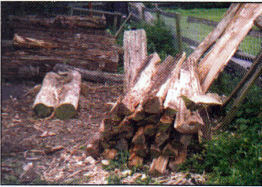 By this system Englands' woodlands were managed and ensured a plentiful supply of wood throughout the ages. The neglect of woodland management is a crime to our heritage. The woods of the English countryside, still existing, have not changed much and are still capable of being managed and harvested. These woods are for free. There are still enough woods to provide the raw materials required, and it is possible to buy a cleft fence post cheaper than a treated one. 1. Cleft is a sustainable product - the more woodland is managed, the more that can be produced. 2. Cleft is long lasting - 50-80 years is a typical lifespan. 3. It's very strong because it splits with the grain. Thus preventing rot from water. 4. It is aesthetically pleasing and absorbed easily into any background (Nature never made anything straight). 5. Cleft is versatile to use and can be made up into all types of stock fencing, buildings, gates and other items. 6. It is traditional and in keeping with its surroundings. 7. Can be converted when green.